Insulated concrete form or ICF is an eco-friendly energy and cost efficient way of constructing cast in place structural concrete walls. 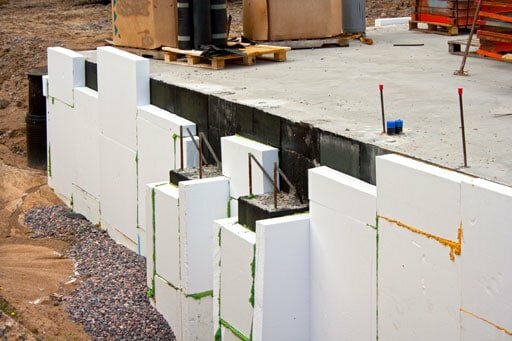 The applications for ICF are endless from subgrade basement walls to entire homes or commercial projects. ICF requires knowledge of all phases of construction from concrete to framing as well as mechanicals. Connor Construction has first-hand knowledge of all of the above, which allows us the ability to construct with ICF confidently. In the last few years, we have completed four large-scale projects with ICF and understand how, when, and where ICF should be used. We are a preferred installer for the manufacturer Fox Blocks. Structural Safety. This factor involves the ability of ICF construction to resist damage and protect occupants from fire, wind, earthquakes, and flooding. Of these, the inherent strength of ICF construction against severe wind loads, including tornadoes and hurricanes, are most notable. Comfort. Though somewhat intangible, comfort deals with important issues such as even distribution of air temperature in the home and the quietness or acoustical properties of the home. ICF construction provides improved reduction of "outdoor" noise relative to standard home construction practices. Energy Efficiency. Energy efficiency is the ability to maintain acceptable indoor living conditions (i.e., air conditioning or heating) at a low monthly energy cost. ICF construction, in general, provides improved energy efficiency relative to standard home construction practices. Durability. This factor deals with a building or material’s ability to resist rot, decay, corrosion, pest attack, and other forms of degradation that may occur over time. While concrete is known to be highly resistant to degradation, there is insufficient data to provide meaningful comparisons to standard home construction. Request a consultation with a Connor team member today!